It’s easy to get caught up in our long-term fitness goals, but it doesn’t mean we should lose sight of the present moment. 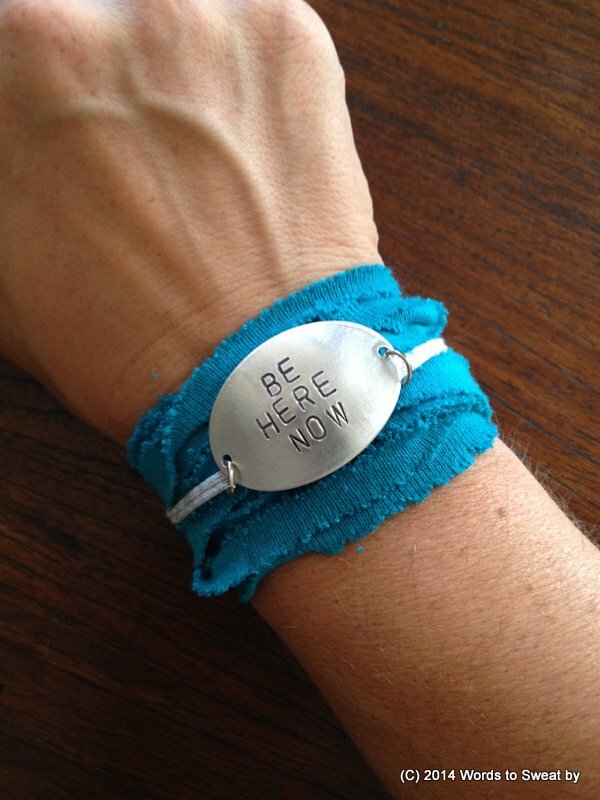 This “BE HERE NOW” bracelet is a daily mantra to help us stay mindful. The aluminum oval measures 1 x 1.5 inches and is hand stamped with “BE HERE NOW”. The charm strung on a bracelet made of lightweight gray jersey knit. To complete the look, you wrap a strand of stretchy jersey knit around your wrist to make a wrap/cuff as a layer under charm bracelet. This Words to Sweat by jersey wrap/cuff original design has no clasps that will catch or snag. Simply wind the colored wrap around your wrist to create the wrap then stretch the charm bracelet over your hand and on top of the colored cuff to complete the look. It’s so lightweight you’ll can wear it every day because you’ll hardly know it’s there except when you take a look to get that boost of motivation.